As with the other Reading Challenges Katrina gives us through Callapidder Days, my eyes are bigger than my reading time! Thank you so much Katrina for encouraging our love of reading. This season was a bit different since I decided to add a new dimension to my blog...giving away products. That meant I was doing a lot of research online and writing lots of email. My blog was totally redesigned by Crissy (her button is on the left sidebar). My reading in November and December have taken a nose dive, which is a grave injustice to my brain! Needless to say, that means I didn't finish all of my reading! That's just horrible! So, how poorly did I do? Let's find out. Books that are crossed out were actually read! How about that. The rest? All begging me to pick them up and read them. I think my favorite book was The Bride Backfire by Kelly Eileen Hake. I was so excited to read a book by the daughter of one of my all time favorite authors Cathy Marie Hake. 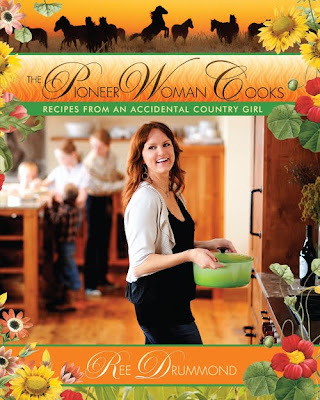 The one book I'm still hoping to get on my list is The Pioneer Woman Cooks by Ree Drummond. All in all, 12 books on the list completed. There were some others that I read that I had forgotten about when I made the list or ended up receiving in the midst of the Fall Into Reading challenge. They aren't listed here. My list continues to grow and come Spring Into Reading 2010 I will have a nice pile ready to be listed! The Great Christmas Bowl by Susan May Warren (recieved)!!!! Hey, you did a pretty good job working through your list, good for you! Did you enjoy The Sound of Sleigh Bells? I am posting my wrap up this morning, an utter failure, but I am posting it anyway, heheee. I love Cathy Marie Hake too! Looking forward to reading Kelly's books.